Welcome to Mike Linnig's Restaurant! We’ve been serving the best seafood since 1925! Are you looking for generous portions of fried fish, shrimp, frog legs, pan-fried oysters, turtle soup, chicken and onion rings? Come to Mike Linnig’s Restaurant and you can have it served to you indoors or out. 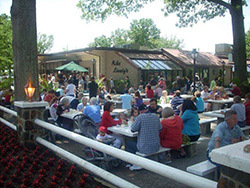 Nestled in a shady grove along the Ohio River, Mike Linnig's Restaurant has been dishing up tasty fried fish and seafood at family prices for many years.